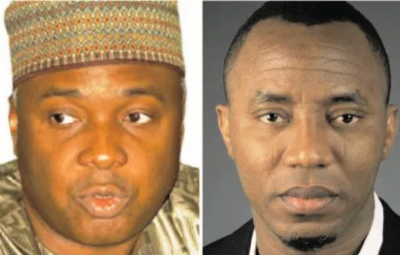 The fight between Sahara reporters founderOmoleye Sowore and Nigeria senate president,Olubukola Saraki took a new turn when the latter won a judgement against the publisher. Justice Adeyinka Oyinloye of an Ilorin High Court in Kwara state, ordered the publisher, to pay the sum of N4 billion as damages to the Senate President,over a series of libelous stories published on the news platform from September to December 2015.
following the publication of series of stories against him by Sahara Reporters. According to Saraki's counsel, the defendants had refused to defend the case despite the service of the summons on them. Olomu said the first series of service involved an arrangement between the office of the Nigerian ministry of Justice and their counterpart in New York, the operational base of the medium. 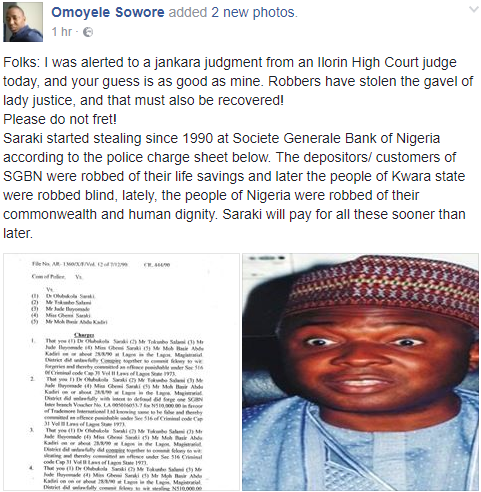 The relief granted to Saraki by the court include “the sum of N1 billion as general and aggravated damages for libelous words falsely, maliciously and recklessly published by the defendants of and concerning the claimant in the online issue of Sahara Reporters of October 5, 2015 under the caption “Nigeria at 55: Bukola Saraki and 83 Inmates Are Running the Asylum. “The sum of N1 billion as general and aggravated damages for libelous words falsely, maliciously and recklessly published by the defendants of and concerning the claimant in the online issue of Sahara Reporters of Sahara Reporters of September 20, 2015 under the caption: “A polished Name for political immorality. Time for Saraki to Go!. “An order for injunction restraining the defendants from further writing, printing or causing to be written, printed or circulated or otherwise published of the claimant the said, or similar libel. Sowore on the other hand's reaction was predictable as he took to his Facebook page to give his verdict on the ruling. Have we heard the end of this? You bet not.Watch this space.